Newly opened in August 2012, this hotel features an on-site restaurant and bar, a fully equipped fitness centre and 24-hour reception. Each studio and apartment includes cable TV and in-house movies. 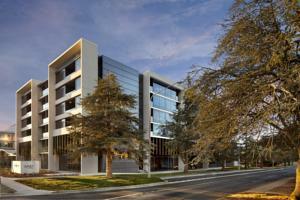 East Hotel is situated in the vibrant Canberra suburbs of Kingston and Manuka, just 7 km from Canberra city centre. Parliament House and the National Gallery of Australia are both 5 minutes’ drive away. Each of these open-plan studios or spacious apartments has a gourmet kitchen with Nespresso coffee machine, plus a 42-inch LED TV, iPod docking station, dining table and chairs, and a private balcony. At The Ox Eatery Bar & Deli, you can dine in or have meals pre-delivered to your room. The bar has an extensive selection of vintage wines, rare whiskeys and fine spirits. Same-day laundry and dry cleaning services are available. Bicycles are available for hire. Guests at East Hotel Canberra can relax with a coffee and a magazine in the lobby lounge area. Free! All children under 3 years stay free of charge when using existing beds. Free! One child under 2 years stays free of charge in a baby beds. The maximum number of baby beds in a room is 1. There is no capacity for extra beds in the room. Any type of extra bed or crib is upon request and needs to be confirmed by management.